There’s no denying the magic of classic Disney stories we’ve loved since we were kids. From the princess who has a fairy godmother to a young lady waiting for true love’s kiss—we all have our personal favorites. By now, we’re sure many of you have seen the live action retelling of Beauty and the Beast—a tale as old as time that we’ll forever hold close to our hearts. Aside from being captivated by the special effects, lovable characters, and timeless music, you may have also marveled at the beautiful locations featured in the film. 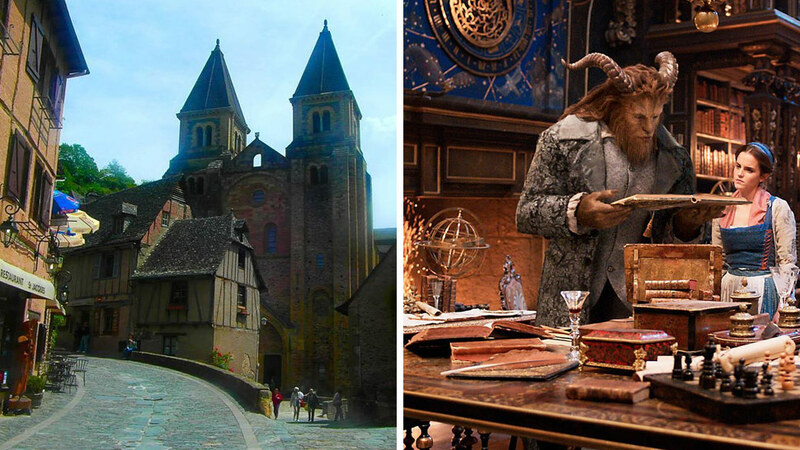 The medieval town of Conques inspired Belle’s small fictional hometown of Villeneuve. Built on a hillside, it still has narrow and cobblestone roads, original medieval timber merchants’ houses (seen in both the animated and live action films) and the historical Abbey Church of Saint Foy which dates back to the 8th century. The church is also a UNESCO World Heritage Site as part of the Routes of Santiago de Compostela in France. To preserve the town and given the small area, large vehicles aren’t allowed to pass through. The chandeliers in the ballroom scene were inspired by a composite of the many chandelier types seen in the famous Versailles palace. The Palace of Versailles or Château de Versailles, was once the seat of political power in the Kingdom of France. Aside from its imposing structure, Versailles also became known to be a symbol of absolute monarchy. One of its famous rooms include the Galerie des Glaces or Hall of Mirrors where numerous celebrations are held. It is interesting to note that only the very rich could maintain chandeliers in the 18th century—one would need footmen to lower the chandeliers, light each candle, and relight them after they burned out. Beeswax candles were very expensive (the masses could only afford to burn rush candles or torches) and only the aristocrats could afford them. An original fairy tale by French novelist Gabrielle-Suzanne Barbot de Villeneuve entitled La Belle et la Bête, Beauty and the Beast also features French references for the Beast’s castle. There are many European styles seen in the castle, but the most prominent style is French Rococo, which ties in to the period when the story was published in 1740. This particular style came about in the late 1700s, and is characterized by ornate flourishes, gold, and the use of soft pastels. Even the animated furniture pieces— like Lumière, Cogsworth, and Mrs. Potts—are in the rococo style. Also known as Joanina Library, the famous library found within the University of Coimbra in Portugal inspired the design of the Beast’s immense library, and it is just as grand. Built in the 1700s, the Baroque-style library made entirely out of carved oak (even the tables and chairs are oak) has multiple levels as well as stairs and ladders that can be used to reach the more than 200,000 rare books—more books than Belle could ever read! It is truly a book lover’s dream. Give your home a Beauty and the Beast twist with a simple DIY project! If you love the story, the film, and the places we’ve mentioned above, you can craft your own enchanted mirror.